Papua New Guinea is one of the world’s least-explored regions. Few destinations conjure more remote or evocative visions, with many areas still largely untouched by time and Western influence. 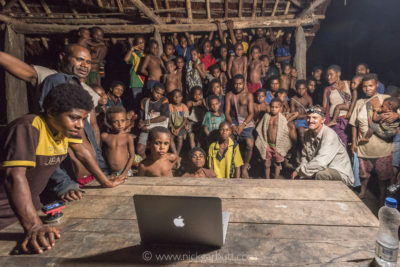 It is a place where pristine rainforests harbor an intriguing array of wildlife, and tribal peoples live in ways that have changed little in centuries. Not surprisingly PNG has been high up on my list of ‘must see’ places for some time. Well I have just returned from my first visit – a two-week trip to look at various areas and investigate options for a potential future tour. And my first impressions? 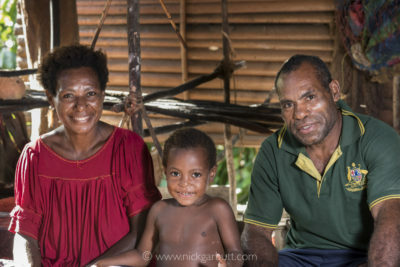 PNG is certainly a different, intriguing, challenging, frustrating, eye-opening, sometimes crazy place and travelling around was an amazing experience. The wildlife is special and specialised, with influences that are sometimes south-east Asian, but primarily Australasian. 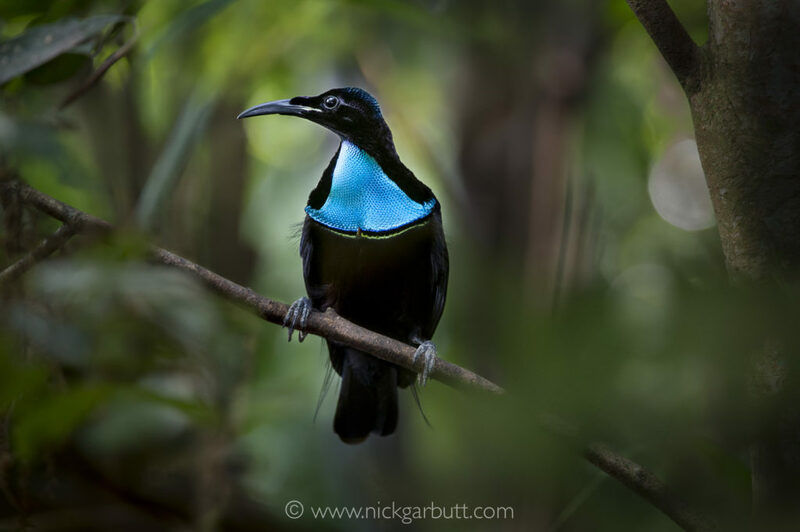 The famed Birds-of-Paradise are certainly the islands’ show stoppers. 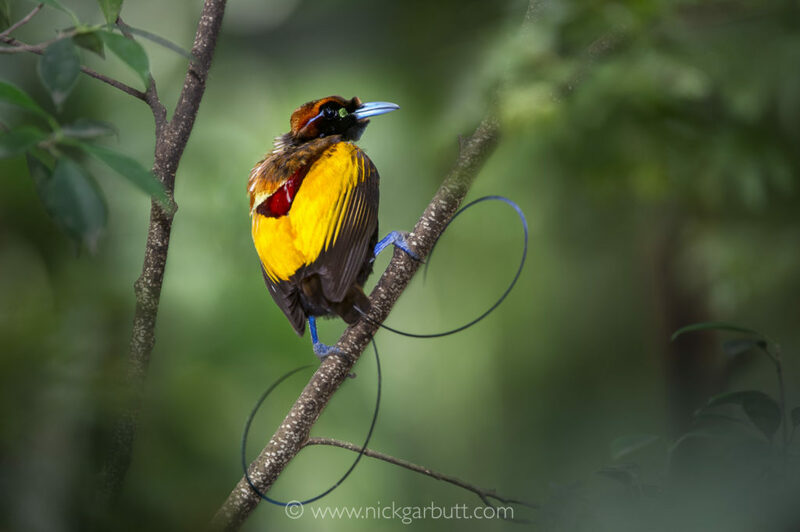 They have long been recognised as beautiful and spectacular, thanks to their ornamental plumage, dazzling colours and extravagant courtship displays and seeing some was one of my main priorities. My trip began in the Highlands near Tari, where I stayed at Ambua Lodge. Situated with commanding views across the Tari Valley, the comfortable lodge lies on the edge of areas of montane forest, with access to further areas of higher elevation forest along the road. In the valley areas below there are smaller forest patches. On my first morning I managed to see four species of bird of paradise – brown sicklebill, ribbon-tailed astrapia, Stephanie’s astrapia and King of Saxony bird of paradise (female only). I also heard one other species – superb bird of paradise. Several other species were also seen, but all of them were unfamiliar to me so identification on my first day was rather difficult. With a longer, less rushed, visit this list would undoubtedly be improved upon. 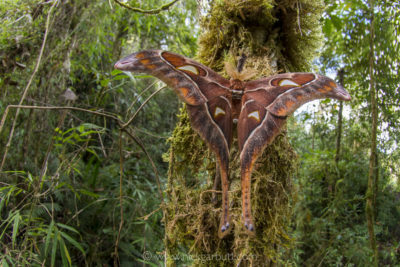 There are also some forest trails close to the lodge, which offer additional birding possibilities – I saw a rather lovely torrentlark along one of the tumbling streams – and also found a spectacular Hercules moth. 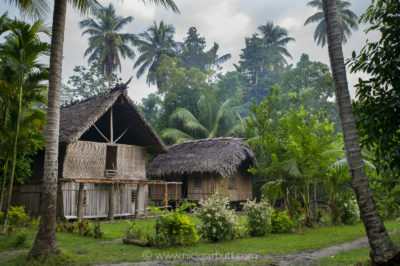 The area is also famed for the Huli tribe, especially the Wigmen. The lodge has arrangements with a number of nearby families for visits, with photography of the Wigmen in their full ceremonial finery arranged. 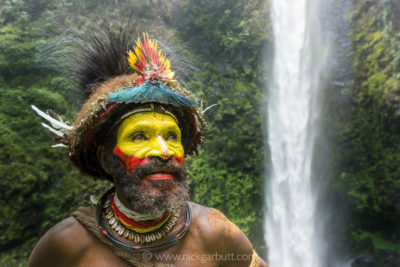 I met Timon Tumbu (chief) and Haro Ngibe who allowed me to photograph them at a nearby waterfall. It made for some fabulous cultural exchange. 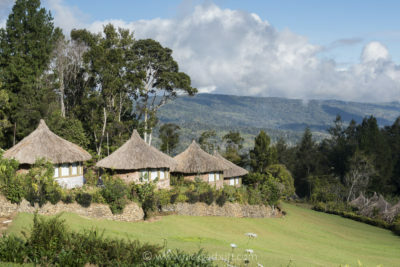 My second port of call was Kumul Lodge near Mount Hagen, also in the Highlands. Located at 2860m in elevation, the rustic lodge is set amidst pristine cloud forest. This is another prime birding location, with various other sites at different elevations accessible to see different species. Around the lodge a variety of species are seen daily, including two birds of paradise – brown sicklebill and ribbon-tailed astrapia. The lodge also has a feeding station, which attracts these birds and many other species too like, common smoky honeyeater, white-shouldered fairy wren and ornate meladactis. The Sepik River flows for over 700 miles from the highlands of western PNG, through the northern lowlands to the Bismarck Sea. 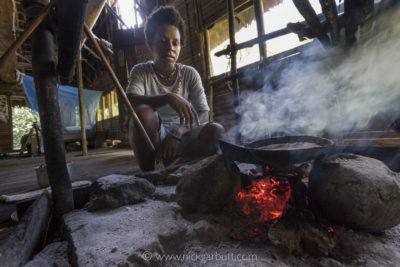 It is iconic and generally regarded as an integral part of any PNG experience. The next portion of my trip was a 4-day canoe trip along the middle and upper Sepik River. I flew to the coastal town of Wewak and met up with Aloese Mateaus, the owner of Sepik Adventure Tours who were organising my trip. Aloese outlined how things would piece together and I immediately knew I was in for an adventure. This is the itinerary. Day One: Drive to Pagwai (4 hours). 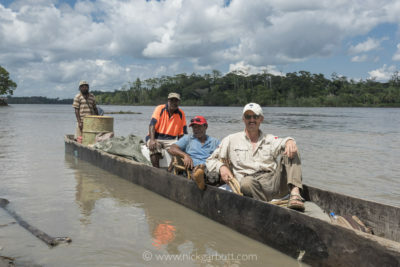 Board dugout canoe on Middle Sepik River and travel downstream for about 1 hour to Korogo. Leave canoe and walk (2 hours) to the village of Yamok. Overnight. Day Two: Walk back to Korogo. Take canoe upstream back to Pagwai (1.5 hours) and continue on the Upper Sepik River to Ambunti (2 hours) and onto Wasui Lagoon and the village of Wagu (further 2 hours). Overnight. Day Three: Visit forest areas around Wagu including lesser bird of paradise display site. Overnight. Day Four: Return by canoe to Pagwai and then road to Wawak, via village of Apangi. The road journey from Wewak to Pagwai is only around 75km, but took well over 4 hours as the road is very poor in places. The journey itself was fascinating as it passed through many forest areas, with various small villages en route. Various stops along the way allowed me to see a few birds. At Pagwai I met my guide Philip, cook Albert and boatman Kenol, who were each from different villages along the Sepik River. Philip was clearly a renowned and sought-after guide and took great pride in telling me he had worked with several Japanese and UK film crews (one of which had brought him to London to work as a translator). After quickly loading the dugout canoe we set off downstream. We passed a few small river-side villages and broken areas of forest, but the only visible birds were small numbers of egrets and herons. After an hour we turned off the main river channel into a side stream that led to a lagoon and the village of Korogo. From here it was a two-hour walk to the village of Yamok. After heavy rain, the trail was under water in places and very swampy. 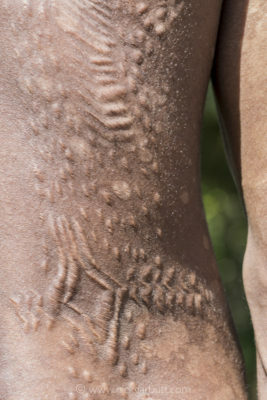 The mosquitos evidently thrived and endless squadrons of them descended onto every scrap of exposed skin they could find. There were often 20 or more on each of my hands! At Yamok, I was met by Micah, the head of the village council. In very good English, he took great pride in explaining how the village operated and showing me around. Central in the village was the Haus Tamboran (spirit house), where the tribal elders and council members (all men) met to smoke various leaves, chew the fat, and discuss village issues. 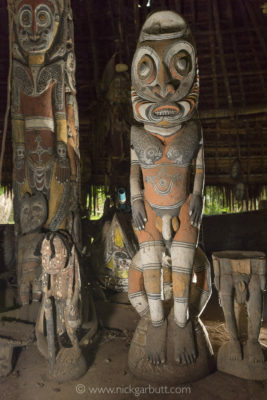 Such spirit houses are a specialty of the Sepik region and the heart of each village, where all traditional ceremonies and major events are held. 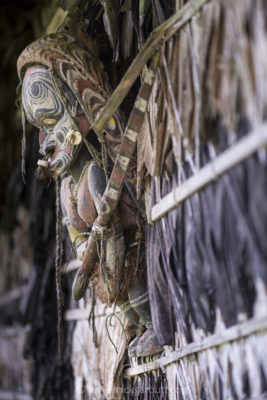 In Yamok (and other villages) the Haus Tamboran was adorned with cultural masks, artifacts and the carvings that related to the particular tribal and clan beliefs of the village. After asking permission, I was able to take photos inside the spirit house. That night I slept in a stilted house in the village on a thin mattress on the floor with an even thinner pillow and mosquito net full of holes. It was great. The following morning we walked back to Korogo, climbed into the dugout once more and headed back upstream. After passing Pagwai, we then continued onto Ambunti, then around 2km upstream turned off the main channel once more into a tributary that lead to Wasui Lagoon. Here the scenery changed dramatically, with ridges cloaked in pristine forest stretching away from the river to the horizon. Bird life increased noticeably too – not only were there more egrets and herons, but many others species were also prominent, for instance; Pacific black duck, nankeen night heron, black bittern, pied heron, great-billed heron, whistling kite, white-bellied sea eagle, black-capped lori, palm cockatoo and rufous-bellied kookaburra. 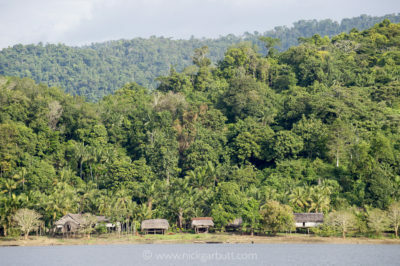 Wasui Lagoon is partially surrounded by forest and the village of Wagu is located in a separate ‘lobe’ of this lagoon that is encircled by steep hills cloaked in rainforest. The lake sits effectively in a ‘bowl’ of forest, where the slopes lead away to further ridges and hills covered in pristine forest that form the Hunstein Range. It is a truly stunning location, that is a WWF designated Wildlife Management Area (WMA) that has been created to protect the watershed and preserve the pristine forests of the region. As soon as we arrived, there was a major surprise – the ‘guesthouse’ was full. A BBC film crew with Frank Gardener (BBC Security Correspondent) and Benedict Allen had arrived the previous day and planned on staying two nights. After a short discussion we arranged to stay with a family next door to the guest house. Philip and Esther welcomed us into their simple home and were wonderfully generous. Albert cooked our food and we all sat on the floor to eat our meals. Philip and Esther spoke good English and we had long conversations about all manner of cross-cultural things. Staying with them was a joy and an amazing experience. 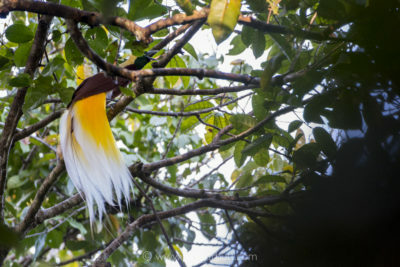 A short distance away (5 minutes by canoe and a ten minute walk) is a known lek (display tree) where lesser birds of paradise gather daily at sunrise. The following morning we set off before dawn to make sure we were in place in good time. 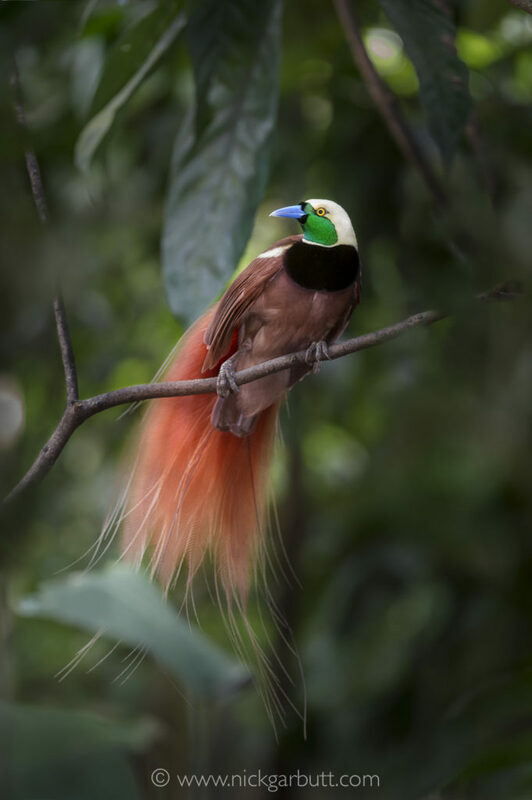 As we arrived the first chinks of light were glancing off the forest canopy and already the male birds of paradise were gathering and beginning to call raucously. The canopy was 20m high, so the viewing from ground level was challenging, but with careful positioning it was possible to make out the shapes in the tops of the trees. As the light improved the displays intensified as several males strutted their stuff to try and impress the gathered posse of females. One particular branch was clearly the principle place to display and the incumbent male occupied it noisily and aggressively maintained his position. Whenever a female came near it would trigger rapid action from the male, who would immediately begin his spectacular dance routine. Forget ‘Strictly’, this is where it’s at. There were also good numbers of parrot species, hornbills and other forest birds to be seen in and around the forests at Wagu, e.g. Blyth’s hornbill, glossy manucode, helmeted friarbird, black sunbird and eclectus parrot but viewing was always a bit of a challenge, so sighting were generally brief. My two days in Wagu, staying with Philip and Esther were very special indeed. It was very humbling to be welcomed as a stranger so openly into their home and share experiences and conversations. The contrast of their village life with my regular life in the developed western world could hardly have been greater, but somehow that didn’t seem to matter at all. My final stop of the trip was something of a departure from what had preceded it. I flew to Rabaul on the island of New Britain, north of mainland New Guinea. Rabaul was once a thriving, vibrant port but was decimated by falling ash from an erupting adjacent volcano in 1994. Today it is something of a ghost town and all the emphasis has shifted to the nearby community of Kokopo. Kokopo hosts the famous Mask Festival, which normally runs for five days in mid July. On the last evening of the Mask Festival, there is the famous Baining Fire Dance – one of the cultural attractions for which the region is renowned. I stayed at the very pleasant Kokopo Beach Resort, which offers tours of local attractions as well as very good snorkeling and diving opportunities close to hand and some early morning dolphin watching possilities. The snorkeling and diving is around Little Pigeon Island, which lies about 4km off shore. There is a good reef with vibrant coral, plenty of fish and other marine life. 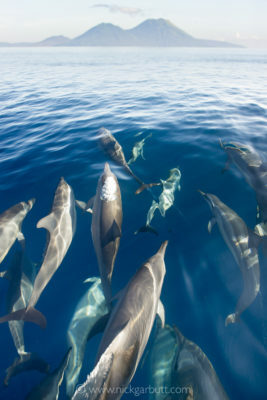 About 5km up the coast is a bay where spinner dolphins regularly gather. Early in the morning they are very approachable and easy to see. They frequently bow-ride the boat and also allow opportunities to swim with them. After this introduction to this fascinating country, I feel sure I will be offering a tour in the future. I am currently working on this with my friends at Wildlife Worldwide, trying to find an appropriate balance between the strongest bird and wildlife elements and the incredible cultural opportunities. We have now planned a trip in the summer of 2018. If you are interested in receiving further information – please click here.